“Clothes make the man”, said Shakespeare, and they can certainly give us a fascinating glimpse into the lives of historical characters and the era they lived in. The Brontë Parsonage Museum in Haworth contains many wonderful artefacts and relics of Anne Brontë and her sisters, but I always find their items of clothing among the most amazing exhibits. This was brought to mind this week by the opening of a new exhibit in Harrogate, “Jane Austen and Charlotte Brontë: Costumes from Film and Television”. 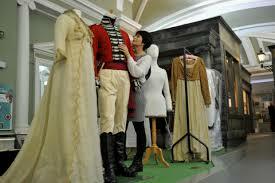 It wasat the Royal Pump Room Museum until the 31st December, and was well worth seeing. On display were costumes worn in some of the most celebrated Brontë and Austen adaptations, including Rochester and Jane’s outfits from the celebrated 2011 film adaptation of Jane Eyre. We know several things about the clothing worn by the Brontës. Firstly, their dresses are inevitably made out of silk. This is because their father Patrick had a morbid fear of fire. With open flames used for heating, cooking, and lighting in the early nineteenth century, instances of dresses catching fire were all too common. The voluminous dresses worn at that time, could easily catch a flame, and the flammable materials used could bring dreadful results. Patrick had presided over many such funerals, and he believed that silk was far less flammable than cheaper materials being used for dresses. For this reason he insisted that his daughters wear it, and it was for similar reasons that he tried to prevent curtains being used in the Parsonage (although the sisters later had them installed). The Brontës were not a wealthy family, and this meant that they often had to repair their own dresses for year after year, until they literally couldn’t be repaired any further. They also had to rely on the kindness of strangers for hand me downs and gifts. Anne’s godmothers Elizabeth and Fanny would undoubtedly have sent clothing from time to time, and we know that Ellen Nussey did as well. For proud Charlotte especially this would have been an ordeal she had to accept. The clothes the Brontë wore were different to what we ordinarily think of as Victorian. The hooped dresses and crinoline dresses, the bustles and the tightly drawn in waists, didn’t begin to appear until the 1850s, after Anne and Emily Brontë were dead. The early Victorian style of clothing worn by the sisters is often referred to as the ‘romantic’ period of women’s fashion, and is an organic progression from the clothing worn during the regency period and earlier. Corsets begin to make an appearance in the 1840s, but they weren’t as constricting as in later decades, and before that the waistline and figure had a more natural look. Dresses were often worn off the shoulder and necklines could be daringly low compared to what we think of as Victorian today. To preserve modesty, white scarves or collars were worn. These can be seen on Anne, Emily and Charlotte in Branwell’s portrait of them in the mid 1830s. Because the clothes worn by Anne and her sisters were often hand me downs or greatly repaired, they were also often out of step with the fashions of their day. When Charlotte and Emily go to Brussels, for example, we hear of Emily being mocked for wearing wide, puffed out gigot sleeves (or mutton chop sleeves) that had gone out of fashion a decade earlier. Petticoats, stays and stockings, were all everyday essentials of the sisters’ attire, and one of the Parsonage Museum’s treasures are these: the stockings of Anne Brontë. When we see Charlotte’s dresses at the museum, we should also remember that Anne may have worn them as well. Although a little taller than the diminutive Charlotte, she may have worn her hand me downs in her youth, whereas they would have been unsuitable for Emily who was unusually tall for the era. Another item associated with the Brontë period is the bonnet, and no self-respecting woman would be seen outside without one. 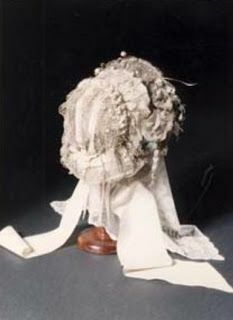 Charlotte’s wedding bonnet is often on display, a delicate and beautiful item that the villagers said made her look like a snowdrop. Another essential item of outdoor wear were pattens. These were metal or wooden soles that were placed onto the bottom of shoes, giving them more grip and waterproofing when walking outside. Aunt Branwell often wore pattens indoors, so that she made a clicking and clacking noise as she walked around the parsonage. Considering that the shoes worn by the Brontës are so delicate, it’s incredible to think that Anne and Emily in particular could walk great distances in them across the rough moorland terrain around Haworth, sometimes in excess of twenty miles a day. People today wouldn’t attempt such a feat without stout walking boots. Many of the Brontë dresses that we now have are a brown or beige colour, but this is because they have faded over the decades. Originally, the dresses worn by the Brontë sisters were vibrant and colourful. Seeing the clothes that the Brontës wore somehow makes us feel closer to them, and allows us to appreciate their work even more. These weren’t just a name on a book cover, they were flesh and blood women. 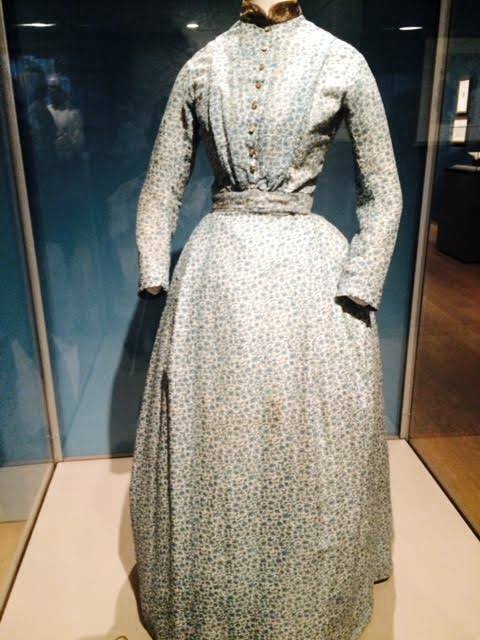 And, whilst fashions have certainly changed since the 1820s, 30s and 40s, I think the dresses of the time are indescribably elegant and beautiful – just like the writing that the Brontës produced. Indeed, during their music lessons, when the Wheelwright girls laughed at Emily’s dress, she barked out, ” I wish to be as God made me!” which undoubtedly caused even more giggles . Next Next post: The Return Of AnneBronte.Org And A Book Giveaway!